I welcome the staff and students of the Venerable English College in this year marking a number of significant anniversaries in the life of the Church in England and Wales. I thank the Rector for his gracious words. Our meeting today gives me an opportunity to speak to you directly, as a father, from the heart! As you continue your journey of responding to the Lord’s call, I would like to share with you some words of encouragement. Above all I pray that you will grow ever more deeply in your relationship with the Lord and in your attentiveness to others, especially those most in need. Love of God and love of neighbour: the two foundation stones of our lives (cf. Mk 12:30-31). First, love of God. It is good to see young people preparing to make a firm and life-long commitment to the Lord. But this is harder for you than it was for me, because of today’s “culture of the temporary”. To overcome this challenge, and to help you make an authentic promise to God, it is vital, in these years in seminary, to nurture your interior life, learning to close the door of your inner cell from within. In this way your service to God and the Church will be strengthened and you will find that peace and happiness which only Jesus can give (cf. Jn 14:27). Then, as Christ’s joyful witnesses, you in your turn can become recipients of the tribute paid by Saint Philip Neri to your martyr forebears: salvete flores martyrum! Second, love of neighbour. As you know, we do not witness to Christ for our own sake but for others, always in service. And we seek to offer this service not out of mere sentiment, but in obedience to the Lord who kneels down to wash the disciples’ feet (cf. Jn13:34). Nor is our missionary discipleship offered in isolation, but always in cooperation with other priests, religious and lay men and women. At times, loving our neighbour is difficult, which is why, for our ministry to be effective, we need to be “firmly grounded in God who loves and sustains us. From this inner strength it is possible to endure… with patience and constancy in doing the good” (Gaudete et Exsultate, 112). This inner strength – this fidelity of love – characterized the lives of your college martyrs, and it is essential for us who seek to follow Jesus, who calls us in our poverty to serve his majesty, and who reveals his majesty in the midst of the poor. One of the ways in which our love of God and neighbour will grow is through living in community. It can be no coincidence that it was your seminary community that formed the lives of forty-four martyrs, enabling them readily to take the missionary oath, made for the first time by Saint Ralph Sherwin in 1578 on the Feast of Saint George. 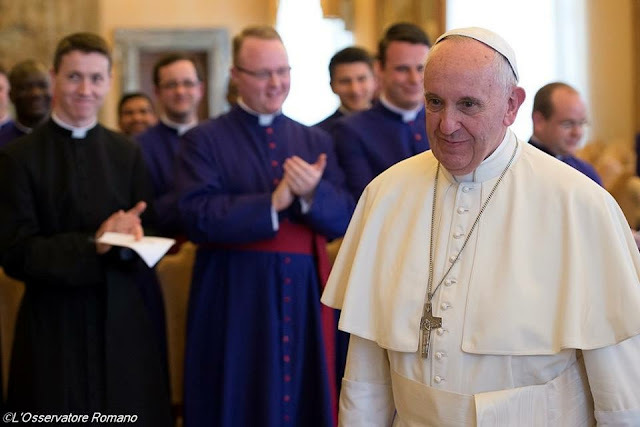 With these saints to guide and inspire you, I hope you will be able to develop that “fraternal love capable of seeing the grandeur of our neighbour, of finding God in every human being, of tolerating the nuisances of life in common…” (Evangelii Gaudium, 92). In our Christian life, there is a considerable obstacle that all of us face: fear! But we can overcome it with love, prayer and a good sense of humour (cf. Gaudete et Exsultate, 126, and the prayer attributed to Saint Thomas More). So I hope you will not be afraid of difficulties and trials, and the continuous battle against sin. I also encourage you not to be afraid of yourselves. By following the example of your heavenly patron, Saint Thomas of Canterbury, who did not allow his past sinfulness or human limitations to stop him from serving God to the very end, not only will you be able to overcome your own fear, you will also help others overcome theirs. Finally, by nurturing friendships, good and wholesome relationships that will sustain you in your future ministry, I trust you will come to cherish your real friends, who are not simply those who agree with us, but are gifts from the Lord to help us on the journey to what is true, noble and good (cf. Phil 4:8). It is with affection that I offer you these thoughts, to encourage your faithful love of God, and humble service to your brothers and sisters. Entrusting you to the maternal intercession of Our Lady of Walsingham, I assure you of my prayers for you and your families, and for all who support the mission of the Venerable English College. And I ask you also, please remember to pray for me each day.